Members can turn £5 worth of Tesco Clubcard vouchers into Avios and be in with a chance to win a trip to Rome. The prize includes business (Club Europe) return flights and 3 nights’ 5-star accommodation for two. The break can be taken any time between October 1 2018 and December 14 2018, subject to availability. Members who book the “Club and Suite Indulgence” package or the “Linger Longer” package can collect double Avios. The former also offers a complimentary night’s stay. The appropriate booking codes can be found in the link below. Choose from a wide range of Mandarin Oriental Hotels worldwide and collect double Avios on the stay. Book and stay by 30 September 2018. How about this excellent 2-4-1 First and Business deals from the UK, from £999, with Lufthansa and SWISS? which I’ve seen reported on a few sites including Head for Points & Jack’s Flight Club. Or if you have plenty of flexibility (and are fine with long haul economy) then you could try this “Get cheap one-way long-haul Economy flights with Lufthansa’s AnyWay Travel Pass promotion” instead. I heard about the above some time ago. I hesitated to cover it as it appears almost unusable by business travellers. What worried me was the fact that Lufthansa gives no warning about possible visa restrictions. Sometimes it can take longer than two days to obtain a visa and Lufthansa forgets that not everybody residing in the UK holds UK nationality. Or indeed that they reside in London where most embassies are located. When I mentioned these points to Lufthansa in London the only comment it would make was to refer me to its T&Cs which state that travellers are responsible to ensure their documents are in order. @amcwhirter A veritable Catch-22! Love it. Summer sale, 20%* off selected flights booked today 15th August 2018, valid for travel across Wizz Air’s network up until the 16th September 2018. *20% discount applies to fares including taxes and non-optional charges but excluding administration fee. This promotion applies on 15 August 2018 from 00.00 to 23.59 CEST on selected flights only. All travel must be completed by 16th September 2018. The price applies only to bookings made on wizzair.com or on the WIZZ mobile app. Seems like Virgin Atlantic are having some relative bargains in Upper to the US & Canada (some connections on Delta & WestJet) as referenced in this Head for Points post. Fly from London Heathrow, London Gatwick, or Manchester to selected destinations in China, Japan & Korea, Southeast Asia, and Australia & New Zealand. There’s only a limited number of seats available at these prices, so book early to make sure you get the best deal. Sale ends 9 October 2018. Fly direct from three UK Airports direct to Hong Kong. New First class companion offer. To celebrate the fact that 2018 is the 4716th Chinese year, British Airways has launched a great First class fare on its flights to Shanghai and Beijing, offering two First class return tickets to these destinations for just £4716. Malaysian Airlines has some economy class offers to Asia / Australasia. Book by September 7. Sale from September 3 to 14, 2018, for travel on its network. Travel can take place any time between October 1, 2018, and May 15, 2019, except during the holiday season (Christmas, New Year and Easter), for a maximum stay at the destination of one month. Passengers coming from any RJ destination to Amman, or via Amman, are offered similar fares, which vary by destination. Or visit RJ’s global sales offices or travel agents. Explore the world with our Special Offers to selected destinations across Asia, Australia and the Middle East. Book by 8 September 2018 for travel from 22 September – 30 June 2019. Destinations: Bangkok, Hong Kong, Jakarta, Manila, Sydney, Singapore, Tokyo, Beijing, and more. For today *September 3 only*. Cathay Pacific has a “Flash Sale” London LGW to Hong Kong for Y and Y+ tickets. Y is from £499. Y+ is from £899. Both return tariffs. Flybe, Europe’s largest regional airline, has today (4th September 2018) announced a limited time seat sale with discounts of up to 20 percent on one million seats across 284 routes covering a wide choice throughout the UK and regional Europe. Destinations include those to Amsterdam, Berlin, Milan and Venice. Booking is available through to midnight on 18th September 2018 at http://www.flybe.com/sale and effective for travel between 2nd October 2018 and 16th June 2019. This travel period covers the upcoming UK half terms, Christmas and New Year, the 2019 Easter holiday period and through to mid-June. Also included in many of the popular routes on sale are those to Palma de Mallorca, Biarritz, Malaga and Faro. Flybe’s ‘Mega Seat Sale’ also features a selection of routes operated by two of its franchise partners, Stobart Air and Blue Islands. London, 6th September, 2018: Today, Jet Airways is pleased to announce its latest offer, whereby customers can receive up to 30% off base fares to India from selected airports throughout the UK and Ireland. The offer is available from 6th September to 17th September 2018, on flights booked direct through http://www.jetairways.com. Participating airports include all Air France and KLM airports throughout the UK and Air France, excluding London Heathrow and Manchester airport. 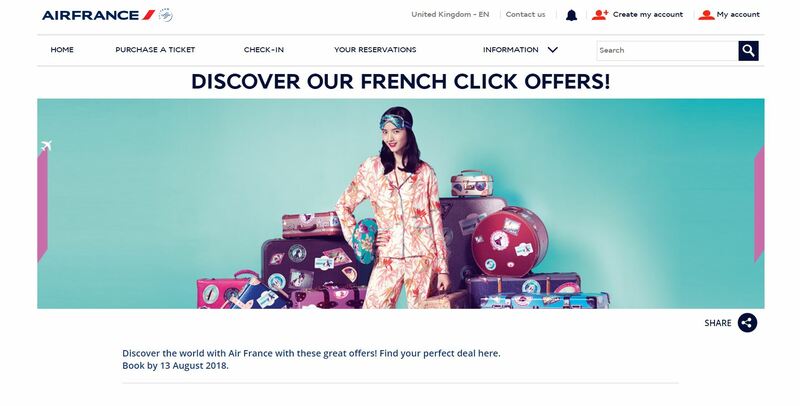 The offer is in partnership with Air France KLM, Jet Airways’ codeshare partners, who help to connect many regional airports across the UK and Ireland with India, through routes via Amsterdam and Paris.